Bananas are one of the most popular fruits consumed in Germany, making the country a key importer of this tropical fruit. Meanwhile stakeholders in producer countries such as Ecuador, Costa Rica, and Columbia face precarious production conditions. This situation requires urgent retrofitting to build in sustainability within the supply chains to overcome the persistent challenges currently found in banana production. The local populations of the main exporting countries in Latin America are dependent on banana plantations. One of the major challenges is the risk to human health and the environment due to the use of pesticides, which have been banned in a number of countries. Other important obstacles include wages that barely provide for survival coupled with uncertain working and supplier contracts, driving both farm workers as well as small and medium sized farm owners into debt. This results in a huge social challenge for the banana sector in these producing countries. In addition to these social challenges, monocultures and the use of pesticides are causing ecological damage way beyond plantations, threatening whole regional ecosystems. 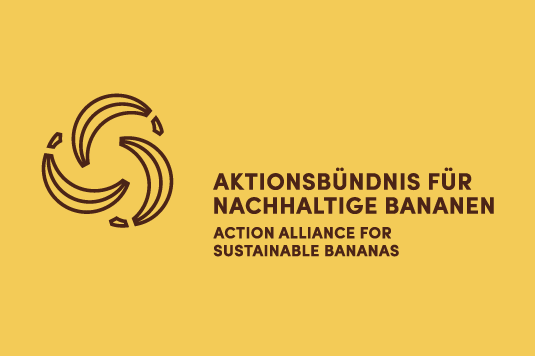 The action alliance on sustainable bananas (Aktionsbündnis für nachhaltige Bananen – ABNB) is a German action and dialogue forum that aims to address these challenges in banana production from the German angle. The alliance reaches out to stakeholders from trade, import, politics, consumer protection, civil society as well as trade unions. It was initiated in autumn 2014 by TransFair. Since October 2015 BMZ and GIZ are funding and consulting the initiative. The CSCP supports the conceptualisation and implementation of the alliance and serves as the project secretariat. The objective of the action alliance is to bring together a variety of players in Germany in order to strengthen responsible actions along the banana supply chain, all the way through to the consumer. It is expected to make a significant contribution to improvements in working conditions and livelihoods in producer countries. Activities by German actors are carried out in close cooperation with the World Banana Forum, which pursues similar objectives at an international scale. Furthermore, the participants aim to develop a framework for action in the near future that serves as a guideline for future activities of the action alliance. To achieve the objectives of the alliance, participants will jointly develop and implement prospective activities towards a more equitable supply chain, addressing their individual chains and involved partners.